Whatever Happened to Ultimate Daredevil? This is a guest post by Matt Duarte whom you may know from The Weekly Crisis and elsewhere. Read his stuff there and, if you’re on Twitter, follow him here. Thanks for this post, Matt, and my apologies for not getting it up sooner! Question time: Do you know what’s the difference between Ultimate Daredevil and his regular 616 Marvel version (the one that Christine regularly covers in this site)? Bonus points if you don’t look it up on Wikipedia. The answer? Absolutely nothing, other than perhaps Ultimate Daredevil is currently dead. How did he get there? What was his life like before his untimely demise? And what does the future hold for him? That’s what I will attempt to cover in this article. For those of you that don’t know, the Ultimate Universe was a wildly successful imprint created by Marvel during the early 2000’s. It’s main attraction was that it starred familiar versions of all the characters you love from Marvel, but all of them getting a fresh start without decades worth of continuity to weigh them down. Ultimate Spider-Man for example, was a teenage boy who attended high school, and readers got to experience his early years without having to dig 60 year old comics from longboxes. Along the way, origins were updated, characters reestablished, and back stories were refined. The success story of Ultimate Spider-Man stemmed from the fact that it provided a fresh new experience: while in the Ultimate Universe, Peter Parker was a high schooler dealing with girl troubles and discovering the extent of his powers, the classic version of Peter Parker was married, a established hero with years of experience, and hanging out with the Avengers. This formula, of using the same characters in a different setting than what they were currently in the Marvel Universe, also worked wonders for the Avengers (called The Ultimates), Fantastic Four, and even the X-Men. All of their transfiguration into the Ultimate Universe were popular and successful for quite some time, sadly we cannot say the same for poor Ultimate Daredevil. Ultimate Daredevil was introduced in the pages of Ultimate Marvel Team-Up, in the very early ages of the Ultimate Universe, perhaps when the creators involved (Brian Bendis, a name that Daredevil fans are quite familiar with) hadn’t quite realized the true potential of Ultimate characters. Ultimate Daredevil was, in simple words, very much like his regular counterpart: he was a lawyer by day, superhero by night, late-20’s, early 30’s redhead citizen of Hell’s Kitchen. Even his origin story stayed intact, getting hit by radioactive waste after saving a blind man from getting hit by a truck. The only apparent difference was that Ultimate Matt Murdock was more willing to work along with the vigilante Frank Castle, also known as The Punisher. Of course, that was just in a couple of issues from Marvel Team-Up, eventually Daredevil got his own Ultimate mini-series, so his back story could be expanded upon, right? Except that the mini-series was called Ultimate Daredevil & Elektra (by Greg Rucka and Salvador Larroca, see image above), and Matt Murdock was relegated to the status of love interest, as the series mostly focused on Elektra’s origin. The series concentrated on Matt and Elektra’s time during college, their friendship and romance, and their eventual parting of ways. While it updated part of Elektra’s origin (she was no longer the daughter of the Greek ambassador, and she took up mercenary work to pay off her father’s debt), Matt Murdock remained basically the same. These similarities meant that people interested reading Daredevil were better off reading the main title than dabbling into the Ultimate Universe. Ultimate Elektra even got her own mini series a year later (by Mike Carey and Salvador Larroca), and while Daredevil featured heavily in the covers, he hardly appeared, though Matt Murdock in his civilian life played a bigger role. He still, however, remained unchanged when compared to his regular counterpart. Eventually Ultimate Daredevil appeared again in the pages of Ultimate Spider-Man (image below), during the arc called Ultimate Knights (a reference to the Marvel Knights series), which also featured the Ultimate versions of Iron Fist, Moon Knight, and Shang Chi. In this story, Daredevil forms the group in order to take down Wilson Fisk, the Kingpin. 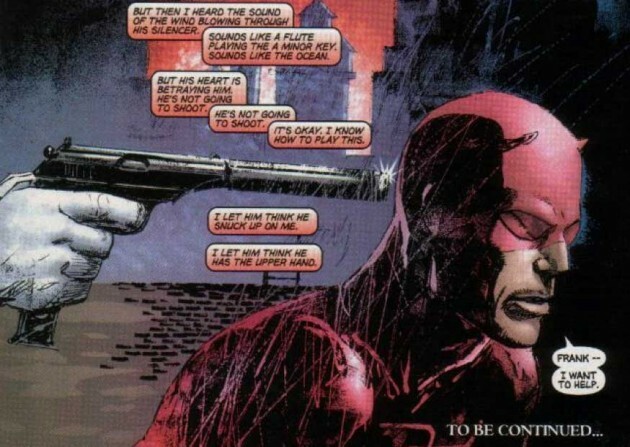 A proactive, as opposed to reactive, Matt Murdock WOULD have been an interesting tale, if not for the fact that in the main Daredevil title, he had just finished doing the same (where he became Kingpin). What makes it even more puzzling is that both stories were written by the same person: Brian Bendis. It seems that poor Ultimate Daredevil could not catch a breath of fresh air no matter how hard he tried. This was ultimately what literally and figuratively killed him. Ultimate Daredevil died during the Ultimatum storyline (by Jeph Loeb and David Finch), where Magneto caused a tidal wave that hit New York and killed million of people in the process. This story was an attempt to freshen up and streamline the Ultimate Universe, which had since grown stagnant and convoluted (the very reasons it was created was to avoid such storytelling), and created a new status quo. 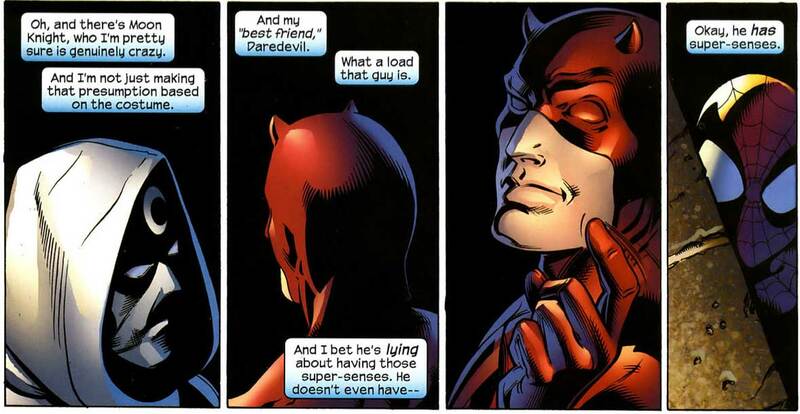 Ultimate Daredevil was sadly a prime example of creators not knowing how to update certain character: his similarities to the main version meant that no one would really miss him. He didn’t even die on screen (like many other characters), or even in the main event: his corpse was found in the pages of Ultimate Spider-Man, and that was the end of Ultimate Matt Murdock. So where did things go wrong? I think I made it clear across the article that the one big problem that no one ever addressed was the similarities between the two versions, making the Ultimate one completely redundant. ANY change would have been welcome: they could have stuck him in high school or university, about a young man questioning his own personal philosophy as he grows up. Or they could have changed his power set ever so slightly, for example making him deaf instead of blind (think Echo’s power), or just change his profession, still in the legal field, but maybe a social worker or a judge. By changing nothing, Ultimate Daredevil was irrelevant from day one. But wait, there’s more! There’s going to be a NEW Ultimate Daredevil, appearing in the pages of Ultimate Avengers Vol 3 (by Mark Millar and Steve Dillon), or something along those lines. The cover images and synopsis blurb indicate that there is someone “leaping around town in a devil costume”. What’s strange is that the costume in question is very similar to the original yellow costume that Daredevil wore in his early days. What’s even stranger is that this new Ultimate Daredevil appears to be a villain (spoilers, I guess? ), since he appears in the “Villain” variant cover. At first I was going to make a point of saying that this is not Matt Murdock, but the story seems to deal with vampires, those ever popular undead characters. I don’t know if this is a different person wearing the costume, or if Ultimate Matt Murdock is back. In any case, I’m glad that they are doing something different with Ultimate Daredevil this time around. As you probably figured out by now, I wrote this guest post before the issue in question, with the new Ultimate Daredevil, came out. Since then, we have learned that the new Ultimate Daredevil is a young kid who has exactly the same origin as Matt Murdock, the same powers, and who wears the costume in honor of the late Daredevil. We also now know that Stick has found him and is training him to utilize his newfound powers. While the idea that the cosmos would set up a replacement, and making Daredevil a legacy character could be intriguing, making the new one EXACTLY the same as the old one just doesn’t sit well with me. It’s lazy storytelling, and probably the sign of bad planning from the editorial office. What’s even weirder is that by the end of the story, this new Daredevil is turned into a vampire. It’s something we haven’t seen before, but it’s also coming at a point where vampires are completely covering everyone’s collective consciousness, so it just comes off as a cheap ploy to latch on to popular trends. At least it’s different, but next time I should be more careful what I wish for. Wacky Power #21 – The aura sensing is back! That’s one thing that bothers me with the Big 2 companies; they seem terrified of change, even in “alternate realities”. I agree with you 100%, it’s lazy storytelling, plain and simple. Great article, btw, although it didn’t inspire me to go after Ultimate DD at all. Thanks for the article! I knew Ultimate Daredevil existed, but it’s sad that he was so irrelevant. Great article, Matt! It really is a shame how badly Ultimate Daredevil was used, especially in the hands of Bendis even while he was doing such great work on the regular Marvel Universe title. I always got the vibe that the Ultimate version was a little angrier and more volatile than the regular version, and if you had asked me a few years ago which version was more likely to turn into an outright villain, I would have said the Ultimate one — but look where we are now! @The Uranian: I don’t think Ultimate Daredevil has been in bad stories per se, but he was often a background character, and pretty much always doing exactly what you expected him to do (completely missing the point of the Ultimate line). I quite enjoy Ultimate Daredevil and Elektra, for example, but it could have easily been in the main Marvel universe if not for all the changes to Elektra’s back story. @Marc: It’s funny, because I wanted to put in a line in the article about Ult. DD being just regular Daredevil having a bad day. (In the end I didn’t find a place where it would flow. ) But yeah, he was more alright with taking the violent approach, though I don’t remember if he ever outright killed anyone. I enjoyed the college-age stuff. I would have liked to see more of that. I found the Marvel Knights stuff ok but confusing as to how Matt aged up so fast. His death was nothing short of disrespectful, and this new vap-devil is just a stupid parody of a classic origin, set up for a stupid punch line. In my opinion a low –class move.